Russian geologists are on their way to a remote region of Siberia's Yamal Peninsula to investigate the mysterious appearance of what looks like a gigantic Sarlac Pit. Opinions are divided as to what caused the apparent crater. 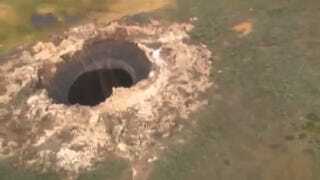 As the Siberian Times is reporting, the unexplained hole was spotted by a helicopter flying over the gas-rich region of the Yamal peninsula, a location that translates to the "end of the world." Initial estimates place the width of the puncture at about 80 meters, but its depth is not known. A debris field around the perimeter suggests that the material was somehow thrown out of the crater. An expedition to the crater has been organised by the Yamal authorities. The team includes two experts from the Centre for the Study of the Arctic and one from Cryosphere Institute of the Russian Academy of Sciences. They're expected to arrive at the scene later today, at which time they'll take samples of soil, air, and water. According to the Siberian Times, initial reports and images were suspected to be fakes, but the new images taken by Russian engineer Konstantin Nikolaev suggests it's very much real. The feature is thought to have formed about two years ago. Scientist have posited a number of theories to explain the crater, though it's not likely to have been caused by a meteorite impact, nor does it exhibit the features of a sinkhole. One website claims that it's evidence "of the arrival of a UFO craft" to Earth. But there are at least two other — and far more plausible — explanations worth considering. The ice can eventually push through the earth and when it melts away it leaves an exposed crater. Dr Fogwill says the permafrost [frozen earth] can be hundreds of metres thick, allowing for large ice features. "It's just a remarkable land form. "This is obviously a very extreme version of that, and if there's been any interaction with the gas in the area, that is a question that could only be answered by going there," Dr Fogwill said. Fogwill says that global warming may cause more pingos in the future. Another explanation has been posited by Anna Kurchatova from Russia's Sub-Arctic Scientific Research Center. She believes the crater was formed by a water, salt, and gas mixture that ignited an underground explosion, also the result of global warming. Kurchatova thinks that enough gas accumulated in ice mixed with sand beneath the surface, and that this was mixed with salt. And indeed, this area was immersed under the sea some 10,000 years ago. The change in climate caused an "alarming" melt in the permafrost, releasing gas akin to the popping of a champagne bottle cork. Given that this region contains many gas pipelines, that's a troubling conclusion. Read more at the Siberian Times and the Sydney Morning Herald.